Want to Sample Vibrant Retirement Living? Try Kendal at Oberlin! We invite you to experience first hand what it’s like to live in our vibrant retirement living community. Our TRY IT, YOU’LL LIKE IT program offers you an opportunity to sample living at Kendal for one or two nights. Participants tell us they want to experience all Kendal has to offer. We’d like to help you do that, and in doing so, help you make an assessment of the Kendal lifestyle. You will stay in a model cottage or apartment. time to explore the Oberlin area and all that it offers. 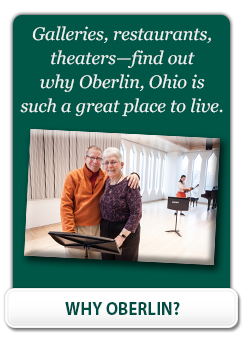 Consider including an event at Oberlin College during your stay. Check out the Oberlin College events calendar for a complete list of concerts and lectures that are open to visitors. We believe that choosing a retirement living community is an important decision, and one that deserves thorough exploration. Our Try It program has a modest fee of $40 per day for an individual, or $55 per day for two people. This includes the cost of meals you enjoy in our dining rooms during your stay. If you would like to TRY IT, please contact the admissions office at 1-800-548-9469.